It was my third Munich High End show now, and this year they even opened another hall for additional show rooms. This year Thursday was not open to all visitors any more, only to trade and press folks. 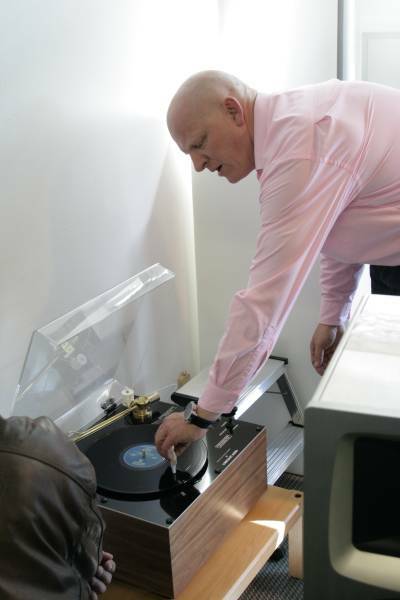 As always, I concentrated on turntables, big loudspeakers, and nice folks. So it is my very personal show report and highly subjective. In the last months, my own setup had undergone a lot of enhancements, mostly due to the purchase of a loudspeaker measurement system, comprising external soundcard, electret microphone, microphone amplifier, and measurement software. I will dedicate an article to this subject later, I think any audiophile who is constructing and building his own loudspeakers, should have such a system just to know what he is doing. 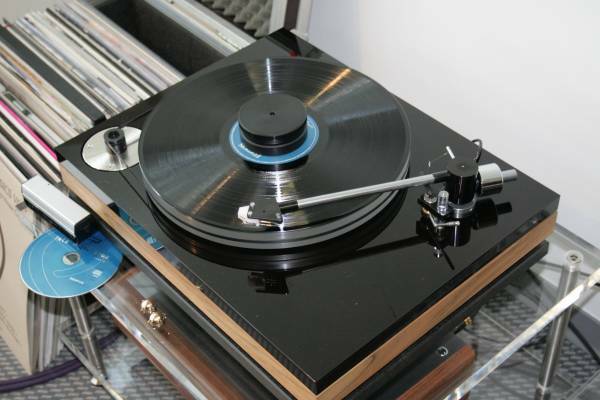 To cut a long story short, I am very happy with my setup now, and wanted to know, how good are the big money systems on the show, played with my own records. That is what I have dared: I took my music and asked the demonstration folks to play it. So, I took one of my most revealing classical vinyl tracks, Carl Orff's "Die Kluge" ("The wise woman", better: "the clever farmer's daughter"), conducted by Herbert Kegel, pressed on a double album as audiophile reprint by AAA (German Analogue Audio Association). This album sports frightening dynamics, very exact timing in the tunes, and a soundstage, which is even present, when no instrument is played, or a voice is heard. This soundstage is perceivable on very good systems only. Also, I took one of my current favourite CDs, from Malene Mortensen, a young Danish singer, who has made a jazzy album "Paradise" as her debut, which is quite excellent. I chose "Spacey" as the track to listen to. BTW, the late Nils Henning Oersted Pederson played acoustic bass on that album. I promise to write an article about this singer, soon. Part 1 deals with best sounds in the show. Part 2 is for the best sounds at some demonstration beside the show. Part 3 is for other good sounds at the show. Part 4 is for other sounds at the show. Part 5 is for demonstration of German magazines. Part 6 is for other interesting stuff, or simply, the rest, that did not fit the previous chapters. These are not in a particular order. All represent some desirable character. All the setups listed here are not perfect - honestly, nothing is - but I could live with them easily. 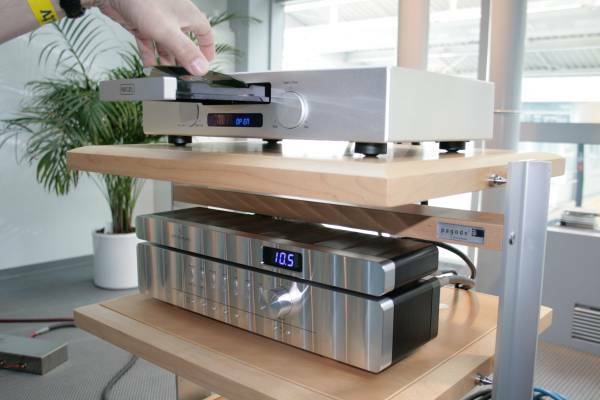 The show room from WOD Audio with Continuum Criterium turntable, Wavac amplification (HE833 V1.3 power amps, PR-T1 linestage, LCR-X3 phono), Kharma Exqusite Reference speakers got the most music out of the grooves of my Orff record. I was amazed not only what it did with my recored, it did evenly well with all the usual suspects, like Miles Davis "Kind of Blue" and the like. The Continuum poored lots of details in uncompressed dynamics, together with an enormous flow sensation, it traced every tune in the music. Marvellous! 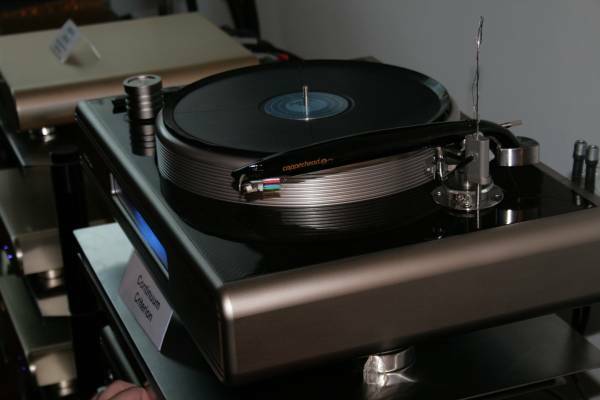 This is the turntable to dream of. 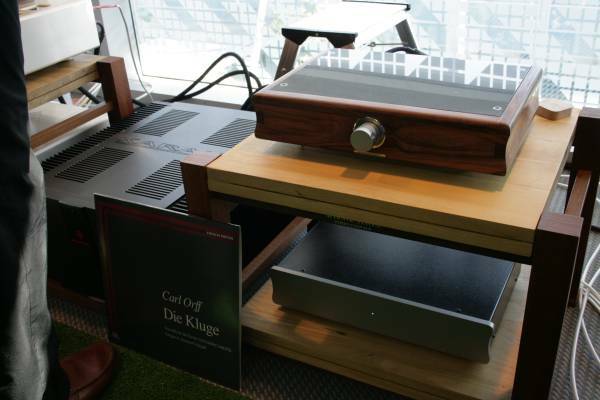 Unfortunately, there was some kind of boxiness and boomy bass in the presentation, though the sound was transparent enough, to let the qualities of the vinyl front-end and the amplification shine through. 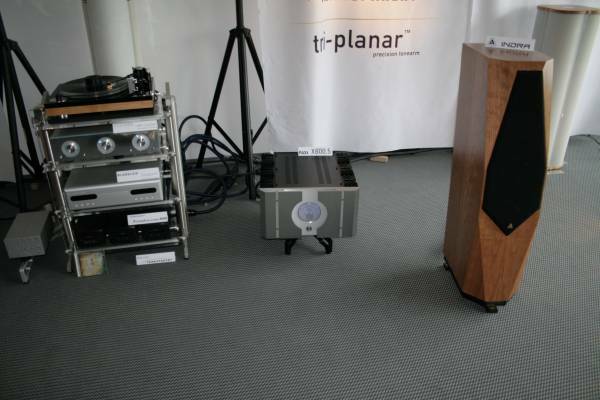 The show room from Taurus with TW-Akustik Raven One turntable with Schroeder Reference SQ and Lyra Dorian, Hegel CDP4A CD player, Rowland Synergy Mk.IIi Preamp and Model 501 mono power amps, Magnepan MG20.1 speakers had the most transparent, relaxed, natural, balanced sound of the main High-End exhibition area. It did equally well with my Orff record and with my Malene Mortensen CD. This was my favourite room, and I spent there several hours each day. 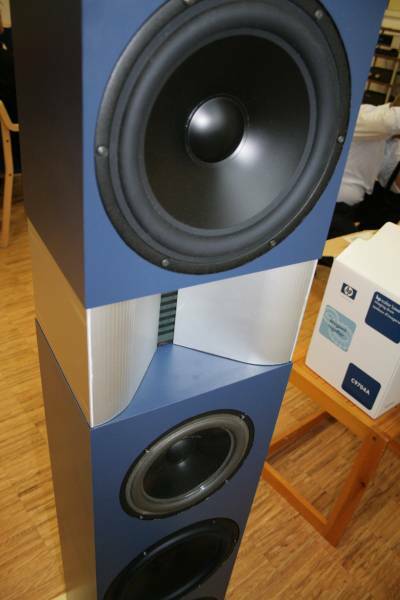 About 3 minutes walking distance away from the official show, Dieter Fricke showed his open baffle high efficiency satellites and high power bass modules, all built around the open baffle concept. His 96db/Watt satellites were driven by Ultrapath tube power amps, while the bass modules were powered by their B&O ICE modules 720 watts mono amps. Most amazing was the reproduction of bass: it was the most textured, powerful, yet effortless bass I ever heard. 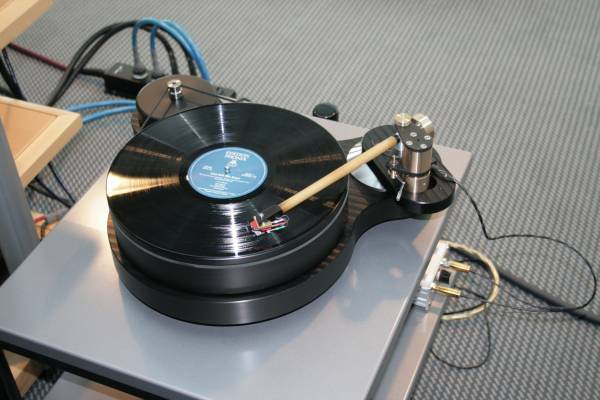 There was an interesting DIY direct drive turntable playing there, named Kosmos Lunar, which had a real locked in timing. With this setup, both my Orff record as well as my Malene Mortensen CD performed equally excellent. The loudspeakers had been trimmed by measurement, but I had the feeling, that the midrange was a bit quiet in comparison to bass and treble. Otherwise, it was perfect. 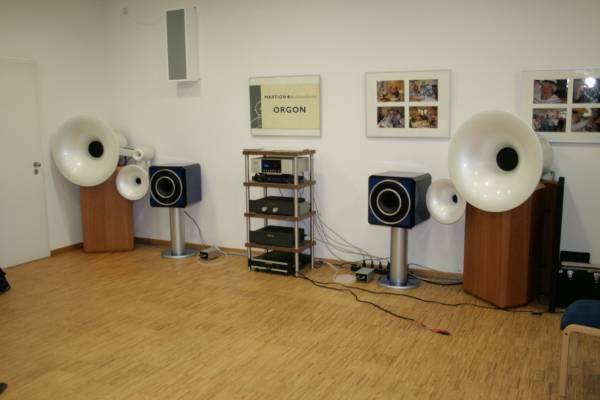 In the same room, Heiner Martion had his State of the Art Orgon active horn loudspeakers playing. 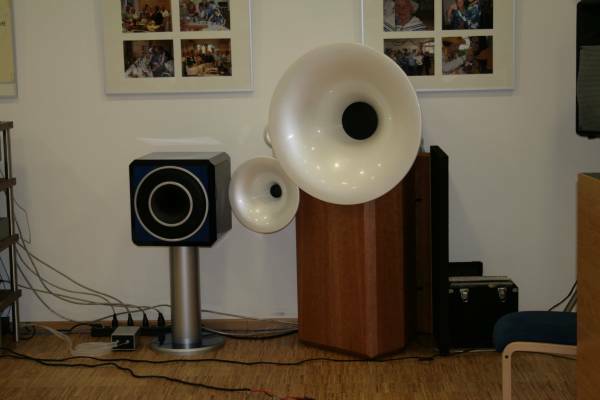 These are by a great margin the best horn speakers of the show, able to teach Avantgarde and the like, how horn is done right. This was great, too, but not perfect either. There was a light emphasis of the 2kHz region, which I did not like, as well as the bass level was about 2dB too low for my taste. Despite these tonal issues, it was as clear as an electrostatic speaker, with uncanny dynamics. These speakers had a quite small sweet spot for listening. 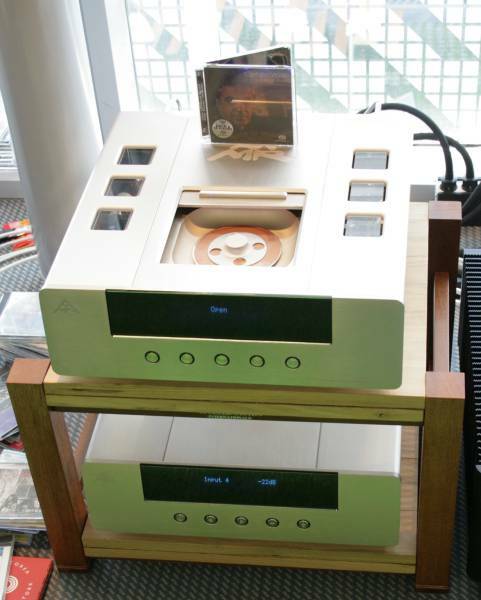 Thomas Fast presented an analogue only setup built around the Connoisseur 4.2 SE phono and line stage. As frontend, he used two Bauer DPS, one with Naim ARO and Lyra Skala, the other with Immedia RPM2. Thomas Fast even cleaned my Orff record. 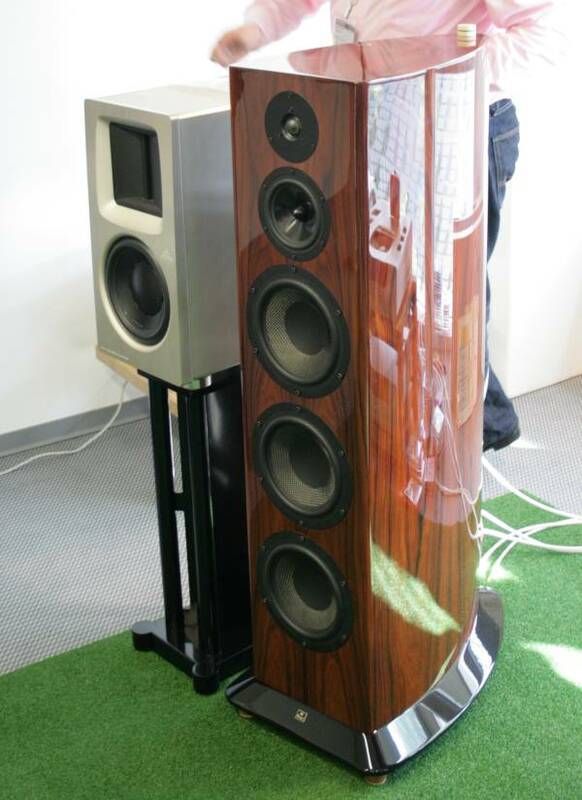 Power Amps are from Karan, and speaker was a big Sonus Faber. 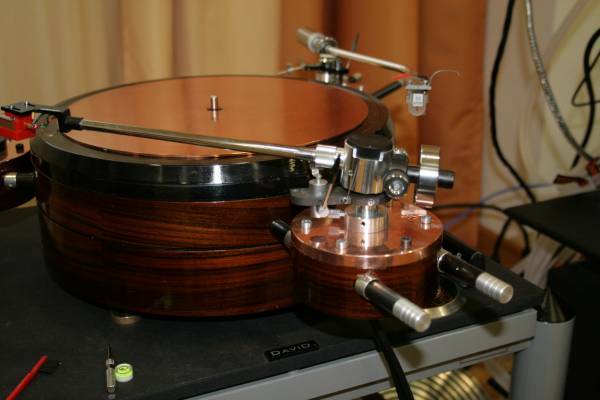 Thomas demonstrated the effect of Acoustic System resonators from Franck Tchang with my record. These resonators do work, indeed. Analogue sound was extremely detailed, with frightening dynamics, lots of details, but I missed some of the ease and flow that e.g. the setup with the Continuum delivered, or the relaxed feeling from the Magneplanar demo show room. 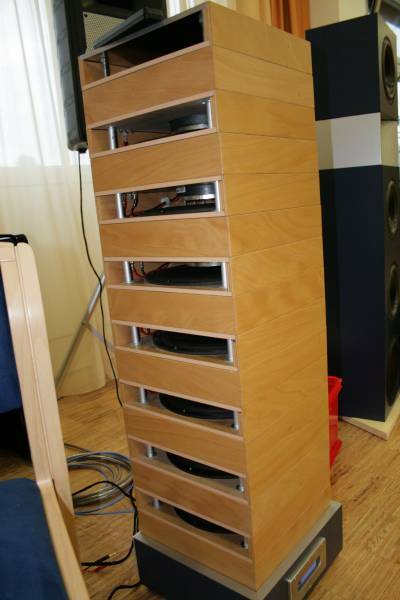 In the same room, Thorsten Loesch, former TNT-Audio co-author, presented the CD player, amps, and loudspeakers from his new company, Abbingdon Music Research and I have to admit, he managed to assemble a top rate, balanced, musical system just from the start. My Malene Mortensen CD sounded very good. 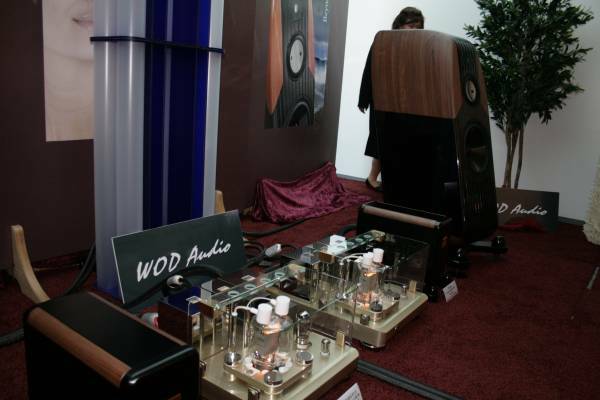 In my opinion, this was the best British sourced hi-end setup at the show. Active Audio presented a setup very similiar to last year, where I liked it very much. 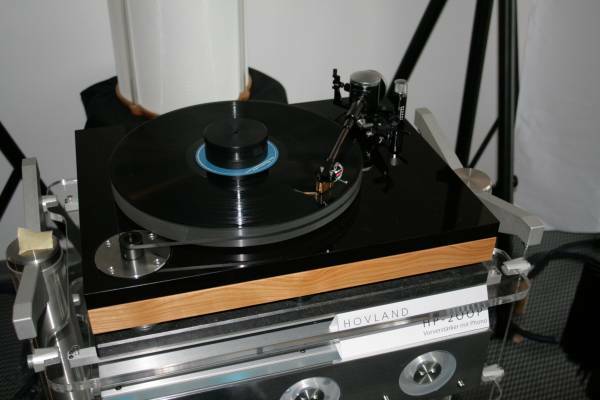 Going into detail, analogue source was a DPS turntables made by Willi Bauer equipped with Graham Phantom tonearm and My Sonic Lab Hyper Emiment cartridge into Hovland HP200P.5 preamp feeding Pass 600 power amps into Avalon Indra. Now this year sonically was not that far away, but I felt it lost some beauty in sound. While I could not really blame it when listening to records unknown to me, I felt a slight compression of raw dynamics as well as somwhat flat soundstage, when playing my Orff record as vinyl source.